Blogger Interview: Kate from Gh0stparties! Hello, everyone! Today I had the absolute pleasure of interviewing one of my favourite bloggers and inspirations: Kate from Gh0stparties.com. Gh0stparties was one of the first blogs I stumbled across and starting reading. I remember finding Kate's blog and reading about three months worth of her past posts in one sitting, Gh0stparties has been a firm favourite of mine ever since. 1.What inspired you to start a blog? I'm unsure really, I wasn't aware of other blogs or a blogging community. I just love to write and buy things - I've always been in to skincare, makeup and fashion so I guess it was just a way to channel these. 2.Do you friends/family know about it and if so when did you tell them? They do, yes. I was quite open about it, and I guess a few of them didn't really understand the point. When I posted it on facebook for the first time there was mixed reactions, most were so lovely and a lot of people now come to me for advice which is awesome. My family all read it, as it lets them know what I'm up to as I'm not the best with keeping in touch - I live in London and my family and boyfriend live in Scotland. 3.How do you deal with negative comments and hate directed at you? I've actually just had a really horrible episode that I'm still feeling very down about, so I guess the answer to this is 'not very well'. Like all people, it's natural to want to defend yourself but I know it's best to drop it. It does get to you, it eats you up and sometimes I think about deleting my blog because of it but you can't let people bring you down constantly. Delete and block is the way forward! 4.Do you see yourself blogging for a long time? I'd like to, but sometimes the negativity gets me down and I worry if it's worth it. I love blogging, I love writing and having a hobby I love so I'd like to think I wouldn't stop. 5.What do you enjoy most about blogging and its community? I've met some lovely people! So many friends, infact most of them now I've moved to London, are bloggers so its great to talk to people who understand! 6.What prompted you to move from just blogging alone to posting on Youtube, also? I guess it's good to branch out. A lot of people asked me to make videos and i quite like doing it. I find YouTube really negative and hard to deal with though. I think I'll always primarily be a blogger. 7.What makeup brand is currently floating your boat? I love NARS blushers. I have a blusher obsession, today I have bought 5 or 6! I also like MAC for blushers and lipsticks and Smashbox for eye palettes. For skincare I like Liz Earle. 8.If you could do a guest post on any companies blog, whos would it be? I guess any of the above! 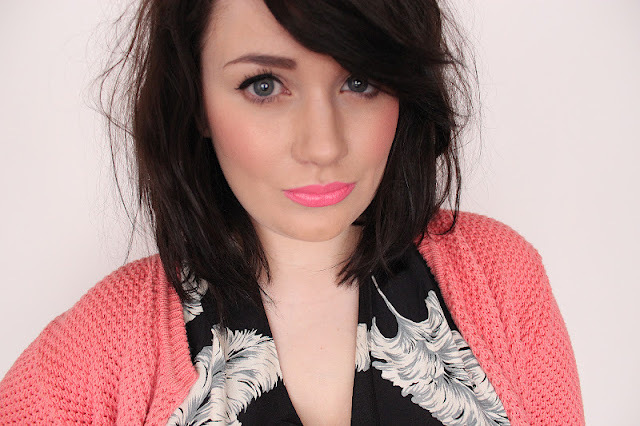 I love Topshop makeup too and I think that really fits well with my style of blog so something with them would be good! 9.Any tips for bloggers who are just starting out? Be original, no one wants to see something thats already been done. Be true to yourself and your followers and keep at it! Make a (good) name for yourself in the community by talking to other bloggers and your readers. 10.And finally, are there any blogs you are loving at the moment? Ooh... I love Vivianna Does Makeup and Blooomzy.blogspot.com off the top of my head! You can find Kate Here, here and here. Orrr follow her on Twitter here.